Damp comes in many forms and, though probably the most well-known, rising damp is thankfully the least common. When rising damp occurs, it is essential that the problem is corrected as soon as possible. Moisture, particularly groundwater, will naturally and gradually seep into porous masonry, rising into the wall via capillary action. Water becomes water vapour as moisture evaporates from the wall in a continuous wetting and drying cycle. As it evaporates, chloride and nitrates (hygroscopic salts) dissolved within it are left behind on the wall surface, building up and having potential to draw in further moisture from the atmosphere. It is generally thought that moisture will rise to a height of about 1metre before evaporating and leaving behind a salt band. The deposited salts and a clearly visible tidemark of moisture are the two most obvious signs that rising damp is present within a wall. Rising damp is most commonly found in buildings to which a damp proof course has not been applied. It can also occur in buildings where a damp course is present but has failed. There are many possible causes of DPC failure but 'bridging' is the most common reason for a damp proof course to stop functioning. The simplest cure for damp caused by bridging is to remove the bridge and allow the DPC to function correctly. This may involve reducing external ground levels and/ or clearing blockages from cavities. Where this is not possible or practical a new DPC can be injected. Removing the salts is essential to break the cycle in which more and more moisture is drawn to the masonry, exacerbating the damage. 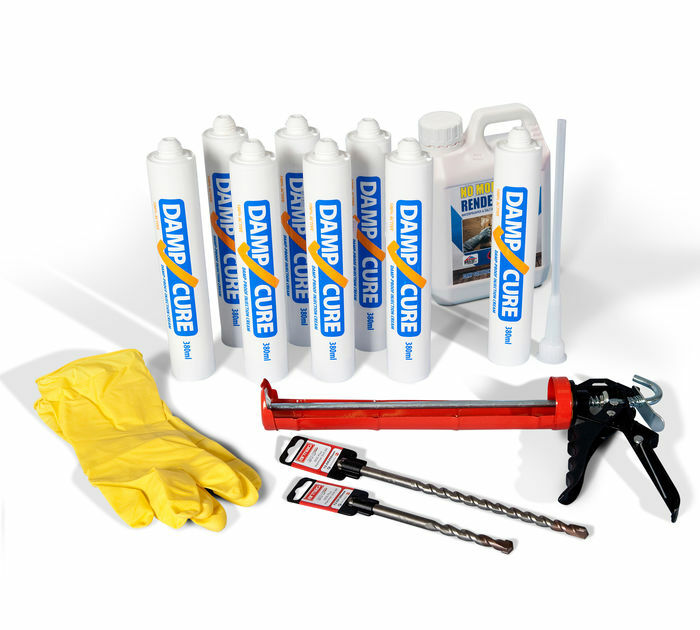 To repair this insidious form of damp, it is important to select damp proofing products of the highest quality to be utilised by a competent person. The Twistfix Rising Damp Kit contains everything required to effectively damp proof 30m of single-leaf wall or 15m of 9" walls. At the core of the kit is three litres of high-quality DPC injection cream and five litres of waterproof plaster additive. Formulated with the use of an innovative emulsi­fica­tion process and without the use of thickening agents, the 100% active silicone-based damp proofing cream is designed to rapidly migrate throughout the pores of damp masonry, quickly forming a complete chemical damp proof course. The plaster additive, when diluted and added to the render mix, acts as a salt-inhibitor to restrict the movement of salts as the moisture evaporates and the wall dries out. Along with the damp proofing cream and plaster additive, the Twistfix Rising Damp kit also contains two professional SDS drill bits, an injection extension tube and a heavy-duty caulking gun. To ensure the product is used safely, a pair of protective gloves is also included within this comprehensive rising damp treatment kit. For information on rising damp treatment available from Twistfix, please contact our expert technical team.